Document Scanning and Management while at times, considered mutually exclusive to file room and physical records management, is really only another method in an overall filing strategy. Considering the filing system in totality, document scanning is but one device that will be effective in managing your records. Too often the presentation is an either/or choice for the consumer. This is one that hears from Filing System vendors, Storage Vendors and Scanning Vendors that these methods are competitive and that it is wise to choose one at the exclusion of others. The consumer is then faced with making a choice between methods, instead of a choice that creates opportunity in each device. 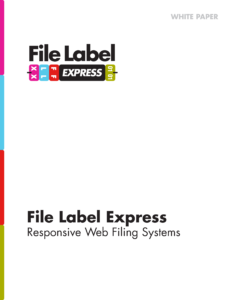 Activating the full power of File Label Express not only allows you to reduce the cost of batch back file scanning, it also allows you to pull records at will and simply attach them to the index you have already created. Your choice to scan records, then simply asks you to consider whether you’d like to do it all at once, or as the records are requested and pulled in the normal course of business, daily.